National Chicken Soup for the Soul Day is observed each year on November 12. According to the National Day Calendar, this day was created to celebrate who you are, where you have been, where you are going and who you will be thankful for when you get there. Chicken soup has earned a reputation for being the perfect meal to enjoy when you’re sick, or feeling down, or wanting to warm up on a cold day. We wanted to combine celebrating that feeling and warmth with our Healthy for the Holidays series. 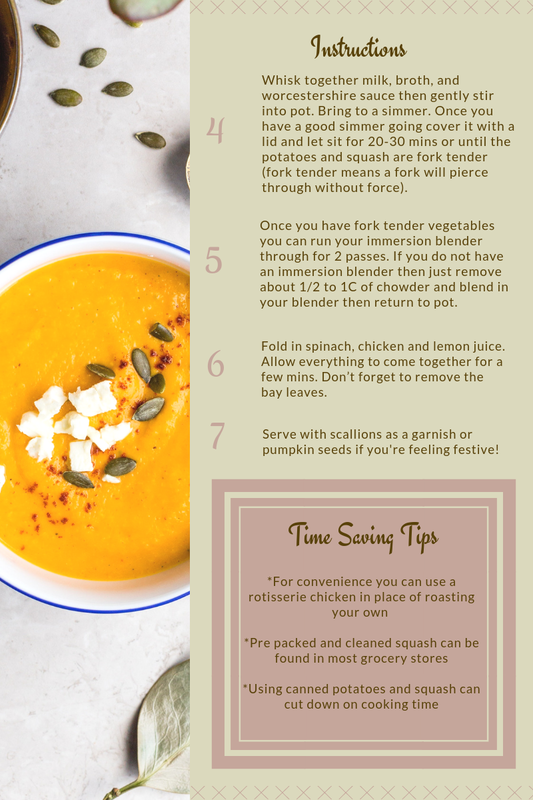 Today we are sharing with you our twist on the traditional chicken soup recipe with Chicken and Butternut Squash Chowder. No backstory here. I wanted to create something for this series that is also healing for postpartum mothers. It’s family friendly and warm for the season while still, for the most part, being healthy and giving you the control to make it quick during the week or with slightly more time on the weekend.